I got distracted from my inner rollercoaster ride of emotions hearing the voices around me. They were speaking an English decorated with distinctive, sharp and strange sounding vowels and melodies that were rooted in other logics than mine. Excited I recognized them as proper British accents. The reason this sounded strange and exciting to me, despite me spending every day together with a British man, is that Chris doesn’t sound like he comes from England – or any other specific English speaking place. I guess he sounds more like he comes from everywhere, which in some sense also is true as he is always on the move, coming from somewhere going to somewhere else, always and only speaking English with the people he meet (as he never learned any other language and in that sense is still very British), and perhaps letting the many variations of this language flow into his own voice. The British accents I heard on the ferry were the first sign that we were about to enter a new country with a distinct culture different from the north-west continental Europe we had experienced so far on our trip. And more than just being a new culture to indulge in for the next couple of months, it was also the culture that Chris had been brought up with and I was more than curious to find out more about what he came from, carried with him and what he had left behind for his life travelling the world. Rolling off the ferry we were encountering the, for me, first real border checkpoint with our bikes. Maybe it was our bohemian appearance that made me slightly worried that the woman at the counter would find us suspicious, although I couldn’t think of anything wrong about what we were doing. Not having a job, sleeping in a tent although it was winter and not having a shower every day, maybe? It wasn’t illegal, but certainly not very normal. The awareness of the recent referendum, known as Brexit, where a small majority of the British people had voted for leaving the European Union to (by other things) get better control of the immigration to the country, also made me a little unsure if I would be welcome here. My worries faded as the woman excitedly flicked through Chris’s passport full of exotic visas and stamps, welcomed him home and asked him questions about his travels. My passport and EU identity was completely uncommented on as the everyday sight it was, and she waved us off with a smile and wishes of good luck. It was dark, but Chris had done some research of Harwich and quickly found us a piece of scrub land in the town slightly hidden from the nearest houses that would do for the night. We pitched the tent and I passed out immediately. At this point I began feeling a bit exhausted by the constant movement and deadlines we had been going through the last month. Resting on the ferry had been good for me and I knew I needed fresh energy to cope with the new country I would wake up to the next morning, and especially its traffic and hills that I had been warned about from my native companion. 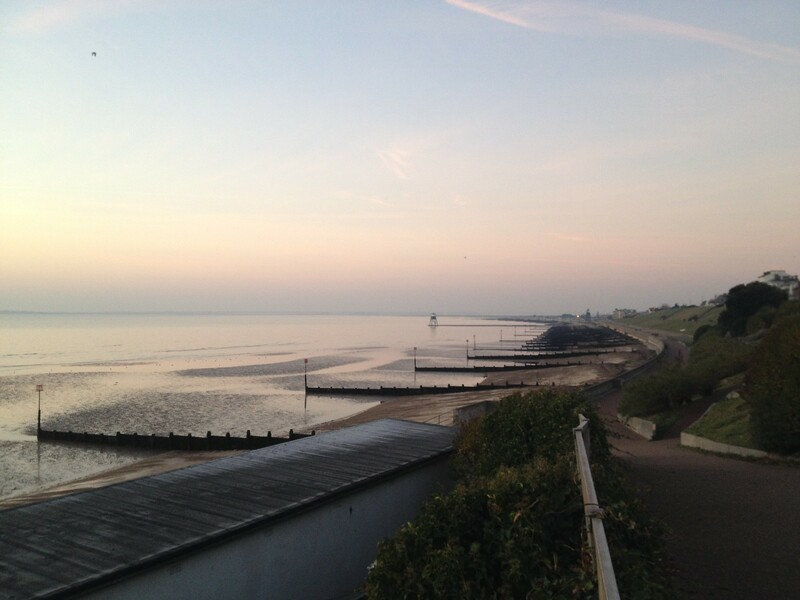 And certainly, I felt we had come to a different place when we cycled the first few kilometres down to the beach in Harwich at dawn. The houses in the area we cycled through were grey, worn and huddled together, but colourful wooden doors lighted up the depressed look, there were trash in the corners of the streets, something I didn’t remember seeing in Denmark, Germany and Holland, and the streets were narrow, winding and criss-crossed each other so I quickly lost sense of direction. Young people were walking to the old station in their tidy school uniforms with distant daydreams in their eyes. There were this simultaneous tidy appearance and careless indifference, a surface that was both see-through, but at the same time hard to get beyond, and this I should come to wonder upon many times throughout our time in the country. We had our peanut butter-and-jam-sandwiches at the beach while an amazing sunrise displayed in front of us mirrored in the still ocean. We only watched it half-heartedly though as we also had the task of preparing our bikes for the new traffic conditions by switching our mirrors to the right side of the bars and tightening our brakes before we could set out on our first day of cycling in England. Then we went for it. Cycling on the left side of the road with all the potential confusion it held only felt odd for an hour or two, then it came back to me from our time in Australia much faster than I had expected. But, it was still a huge contrast to the pleasant cycling in Holland, as we were now cycling on the roads together with the motorized traffic and this traffic came in a persistent flow in both directions and from every oncoming road. There were cars everywhere. Moreover, the flow was constantly blocked by the many cars that were parked alongside the roads only leaving space enough for one car to pass at a time. It seemed ridiculous that there were cars parked on such busy, narrow roads instead of in drive ways and parking lots, it clearly felt like the number of cars had exceeded the capacity of the system a long time ago, due to more and more communters who depended on their cars and therefore accepted the crowded conditions. I began to understand the strategy for manoeuvring in these conditions though. While cycling, I would carefully observe the traffic coming towards me and the parked cars on both sides of the road ahead, I would look back to observe the mood of the drivers behind me, would they let me go first or try and overtake me, and I would then consider if I had the space and pace to go around the parked cars or were better off stopping and giving way for the cars. It was hectic, constantly looking, stopping, moving, looking, stopping, looking, moving. But as I began to feel and follow the flow it felt less chaotic. I also noticed a sense of consideration, flexibility and patience from the drivers, well at least from most of them, that was necessary and new. It worked alright as long as everybody performed a great amount of awareness and patience, but what would happen in the moment someone didn’t? When a text beeped on the phone or the kids in the backseat began to cry? Fortunately, that situation never occurred around us. Chris emphasized several times that I had to be polite with English drivers and always greet them if they had to stop and give way for me. Otherwise they could get very angry, he said, and I imagined I didn’t want to experience that. Despite my fears I didn’t remember to greet them at first, but day by day exchanging a nod, smile and a little wave soon grew into a habit that I came to appreciate a lot. It was a nice little moment of interaction with the other people I was sharing the roads with. Cycling through the countryside was mostly a pleasant experience as Chris led us via tiny roads with not much traffic from one little village to the next. In these villages, we would usually find a green, which is a little patch of grass in the middle of town with a bench and some trees, an old stone church with a graveyard around it, a red phone box and an old, traditional pub. One time we went into one such pub to ask for water, and because I was very curious to see what it would be like inside. My anticipation was satisfied as I saw all kinds of traditional, nostalgic knick-knacks and pictures on the walls, a fireplace with a warm, burning fire, a wooden bar with a middle-aged woman behind and people of all ages and kinds reading the newspaper, having a pint and chatting with each other. The sense of a local community was rooted here, and I imagined how it could be both so comforting to be a part of it, but also that it would feel slightly restricting and perhaps out of touch with the big, wide world that began beyond the fields in the horizon. The landscape we cycled through was not so different from Denmark and Germany, but the fact that we rarely saw it because of the high hedgerows that grew along all roads made it feel different, a bit like cycling in a big labyrinth. The feeling of not knowing where I was going were enhanced by the misty weather and the fact that Chris was in charge of the route. I just followed his red and orange shape ahead of me up and down the hills, turning left, turning right, and I enjoyed to surrender and let him lead me into the unknown that was all so familiar to him. At dusk the quiet roads grew busy with commuters and we tried to find a place to camp already before it began to get dark to avoid the rush. Even though all acres were fenced and used for farming and grazing animals, we managed to find small, old forests just at the right time every evening and it was like fairy-tale worlds in there among the crooked, mossy trees and hollow tree trunks. We didn’t meet (m)any other cyclists, but we did meet quite a few people walking their dogs. Dogs seemed to be a big thing here, everyone had them, and some even hired a professional dog walker who got paid to walk and look after other people’s dogs. I realised how severe the British dog passion was when I came to know of the game Dog Bingo. It was a great game, even for a person with just a moderate interest in dogs (and all other animals) like me. Every time we met someone (walking their dog) they began the conversation, not with a greeting or a question, but by telling us their opinion about us, like: ”You picked the right day for that” and a little later ”Wrong time of the year for that”, or ”You look like you´re on a tour around Britain”, “Nice decorations” and ”Wow, you´re very keen”. One also spoke on behalf of her dog’s saying; ”They´ve never seen anything like it” and when we arrived in Cambridge sprayed in mud after having cycled on an old Roman road that was now a footpath the comment was: “You should get some mudguards”. A few times we made shortcuts using the bridle ways and public footpaths that were to be found everywhere running over the fields away from the roads. At this time of the year it was often a very muddy experience and I found that the British mud was extraordinarily muddy and sticking stubbornly to my boots for hours, never drying and falling off. It was some remarkable mud. On one such small, muddy path our undramatic ride was interrupted by a horrific sight. From a branch overhanging the path a cuddly toy Santa was hanging helplessly upside down, “Please, HELP ME, please!” cried the polite, British Father Christmas. There was no way we could ignore his pledge although our cuddly toy seats were already fully booked and occupied. We ought to save him from this tragic destiny. Fortunately, Santa seemed to recover from the traumatic experience quickly and as Christmas was only few weeks away he suggested he’d come with us to make sure we and all our cuddly toys got some proper presents. Placed in the basket he immediately started to search for presents for us and the cuddly toys among our belongings, offering Chris a cycle computer and Karen Kevin’s pink hoodie. Surely, he was still a bit disturbed by the shock, but his good and pure Christmas heart could not be doubted. On our third day, we arrived in Cambridge. At the feet of the old, beautiful university buildings, colleges and churches the cobbled streets were bustling with a mix of students, workers, tourists and homeless people. We sat in a park soaking up the atmosphere when a man, named Adam, came to us and asked, if he could draw one of our bikes, as a practice for an art course he was doing. He picked Chris’s bike and we had a nice chat with him about our different life styles while the bike with all its angles, bundles and history gradually emerged from the pen on the blank paper. The next day we closed in on Chris’s hometown and places I had heard many stories about began to materialize. As we followed a cycle route on a former railway line to Bedford we stopped to watch a huge group of ducks and geese squawking and waddling around chaotically chasing each other like kids in the school yard. They had all kinds of beautiful patterns in their feathers and it was very amusing to watch them, especially when a big turkey appeared, like a teacher on watch, and scared the crowd off with weird screaks and a self-conscious and yet clumsy stride. Standing here, we got to talk to two men who were very impressed that we had cycled all the way from Denmark. That was really something. They then found it even harder to believe that we were actually cycling the whole length of the path, which was about 15 kilometres, and thereafter would continue all the way to Wales. Surely, we were not going to make it there before Christmas? We continued on to the little town Bedford which offered some surprisingly positive and memorable experiences. First, we saw a big pyramid of glass, a mix of Egyptian and futuristic architecture that looked much out of place and time, or just like it was built in the 1980’es. According to an old man we asked, there were not either mummies, robots or a discoteque inside, but a swimming pool. We then went through the park along the river in the town centre which was busy with people out for a stroll. I couldn’t help smiling as we passed a young mother pushing her child in a pram while wearing a pink, decorative ribbon saying “21 today”. I sincerely hoped somebody would answer her pledge for attention wishing her ‘Happy Birthday’, sadly I was not quick enough. We took a break on a bench watching several long slim boats rowed up and down the river by young teenagers in a true British college style like I’d seen in movies. What I’d never seen in the movies was the coach cycling alongside on the banks shouting instructions at them, but that’s how it happens in real life. Or at least in Bedford. Some spoiled swans came over begging for crumbs and as we began throwing bread to them a group of seagulls suddenly hung in the air just above our heads. They did the most incredible acrobatics flying very close to us and standing still in the air waiting for our throw, following our movements and succeeding in some incredible catches. It was amazing to sit in the middle of the swarm and interact with these cheeky and insistent birds. We followed the river through the town sharing the path with the shouting coaches and diving under low bridges, under one a group of youngsters hang out around a ghetto blaster playing loud music. Then we passed a grey Sikh temple made of concrete that both in appearance and location was so far from the Golden Temple in India, but suddenly the sun came through, the white domes shone like gold and the connection was revealed. Bedford seemed at the same time so ordinary and so unique, so alive and so full of variety and contrasts, being home for all kinds of people with all kinds of lives. It had a pulse of present life different from the nostalgic villages and pretentious Cambridge that somehow seemed lost in the past. At dusk, we arrived at yet another little green and sat down on the bench. This little village was Newton Blossomville. These houses, this road, this green was what Chris had known as home for more than half of his life and I now saw it for the first time. He had walked here every day on his way to school as a little boy, and I peeked in through the windows in the school building. In there he had learned to read and write, at the playground he had been playing games and dreaming of the world, I imagined, pretty much like he was still doing now. Then we went up and knocked the door of his child home. I was excited to finally meet his parents and too tired and unwashed to be nervous, they would have to take me as I was, at least their son was just as filthy. I was a little concerned about my manners being polite enough though, and in my head reminded myself to say ‘please’ all the time. I also wasn’t sure about if I should shake their hands or give them a hug. They opened the door and greeted us warmly, and now I actually can’t remember if it was with handshakes or hugs, but I felt welcome and quickly forgot about the ‘please’s as it didn’t seem to matter so much with them. I was very, very curious and eager to see and grasp every little detail, like the familiar shape of his mother’s hands and nose, his fathers big oval eyes and the way he walked, his mother’s hedgehog slippers, the sound of their soft toned voices and their laughter that came so easily. Finding nuances I already knew in these strangers gave me a comforting sensation of coherence. I felt myself sinking into the neat, fluffy home with big sofas, thick carpets and heavy curtains, soft towels and beds with bedcovers in matching colours. It was a safe little world here. One thing that especially excited me was the cross stiches Chris’s mother made of wild animals, they were in bright colours and very exotic. A perfect starting point for dreams about travelling, although they also represented cosy hours of fiddling from the heart of this home that protected one from the wild world out there. We spend time looking at old pictures and notes and talking about when Chris’s dad had built his own boat as a young man. Chris’s aunt and uncle came over for dinner and the conversations switched mainly between our travels and living abroad, like his aunt and uncle had done, and home decoration and internet packages. I mostly just looked and listened, saw and felt all this that once had surrounded and formed the man by my side in something that felt like a different life time, meanwhile the shepherd’s pie disappeared from the plates. The next morning we had been invited up to the little school so Chris could tell the kids about his travels. It was such an intimate and inspiring moment to see and hear him draw the connecting lines between the room, the chairs, the kids with their immediate excitement and reactions like “I’ve also been to France”, and himself and the continuous bike ride he had undertaken to places, people and experiences so far from the little village universe. We continued the trip down memory lane by visiting the nearest town Milton Keynes, said to be the most boring town in the whole kingdom. Surely it lacked the charming traditional look that characterized most other towns we’d been to, as it was a so called ‘new town’ established in the 1960’s with a big mall in the centre surrounded by causeways and quiet neighbourhoods. I found it a fresh difference though and I was not bored at all, but enjoyed both the network of cycle paths that Chris knew so well, the geese we met (it seemed like a small group was still hanging on), the chips from a Fish’n Chips shop that Chris had talked about getting for days for good reason, and seeing more places where this and that story and memory had its home. I appreciated to now have a physical understanding of the roots in him and how much they had stretched and bent without breaking. We now had two days of cycling to our final destination, a small town called Malvern near Worcester. Here we had planned to stay for a month or two to spend time with Chris’s sister and her family who lived there, to have a real family Christmas and for Chris to finish writing his book about his previous travels before we set out on the next, long leg of our journey. It began to rain for the first time since we had left Denmark and the hills got bigger. My knees were aching a bit, my brakes wore down in the rain and Chris’s wheel began making a strange and worrying ticking sound. We crossed our fingers it would make it the very last bit of the way and kept going. This penultimate afternoon of cycling was not too pleasant, and I really began to feel knackered physically and mentally. On our last night, no woods for camping showed up, but we managed to get into a tiny patch of trees among the endless fields, by pushing the loaded bikes through a small opening in a hedgerow. Really it was not possible, but we did it anyway. It was still raining, and as I unpacked my sleeping bags I realised that the one I used outside the warmer one had got wet at the bottom. I used it anyway, but by midnight it was soaked as there were now puddles in the tent, and for the rest of the night I was lying awake with wet feet and my knees up under my chin. Obviously, I was very tired the next morning and really struggled to keep up the good mood. Fortunately, the weather had improved, it was a fresh and clear morning and the landscaped had changed and was now bolder with continuous low, green hills with flocks of sheep and stone walls and not much else. Now it really looked like we had travelled to a different place. After a long climb up to a church, we could see a lump of higher hills in the horizon, it was Malvern Hills, our goal. The sight of this plus the cup of coffee I just really longed for (given to me by a sweet couple that came out from their house to talk with us), injected a portion of optimism and energy in me. Unfortunately, this portion was not big enough to get me through the muddy mud and thorn bushes on the bridle way we found ourselves pushing the bikes through a few minutes later. The pushing was so heavy and I didn’t have any more energy in my body or my mind. I cursed the bike, the mud, the thorns, the trip, myself and my temper and weakness, and asked Chris to leave me alone with it, which he wisely did, because I was not very nice to be near. The thought of leaving the bike there and just go home and rest felt serious for a few seconds. But then, the consequences of that idea was just not appealing at all. There was nothing to do but keep pushing and in the end, it was really not that bad, and I made it through. But I felt embarrassed and worried about my reaction. I knew that this was exactly what this trip was also about, going beyond my physical and mental limits and learning to behave sensibly and maybe even enjoy it out there. But I felt I needed more practice. I knew there were much bigger challenges awaiting me than a muddy bridle way, like mountains, deserts, storms and sparse resources, and I thought of it with both anticipation and slight concern. With the view of the sun setting behind Malvern Hills, we cycled the last kilometres into the town, a new place we would make ours for a little while and for ever in our memories. We dropped in briefly at the home of Chris’s sister, her partner and their three little kids that I met for the first time. Again, it was very exciting and comforting to meet Chris’s family and feel the bonds between him and his sister and the kids that heard many stories about their Uncle Chris who cycled the world and whom they loved to play with. I was looking forward to get to know them better as I realised that I was also getting a new family here together with a new identity as Auntie Dea. Finally, we continued up the hill to our new, temporary home, a room we rented by a woman called Jane opening her home for us. Here also lived her partner Lawrence, Jane’s ten-year-old daughter Leela and the good, old dog Ben. We were welcomed with spaghetti and a warm, openhearted atmosphere that immediately made us feel welcome. Resting was so good, Christmas was only a few weeks away, we went to watch the Pantomime, we had smoothies, Chris wrote on his book, we played with the kids and walked in Malvern Hills. A new little chapter in our story had begun. I am really enjoying your blog and Deas writing is delightfully expressive and evocative. Nice work , I will be following your adventures . Thank you so much Anne, we are very happy you like it and will follow. We promise we will enjoy, hope you will too!